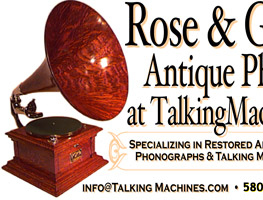 Specializing in restored antique spring-driven Victor, Edison, and Columba Phonographs and Talking Machines since 1986, including authentic pre-1929 talking machine accessories, memorabilia, and more. 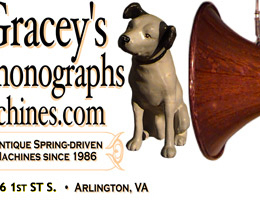 elcome to Rose & Gracey's Antique Phonographs web site TalkingMachines.com! Please note that we are no longer restoring or selling machines. We are still selling memorabilia and a few parts. For instance, you can find a variety of Victor Orthophonic Reproducers in our Parts and Supplies page and you'll find some Talking Machine horns in our Horns, Parts and Supplies page too! There are also some neat items now available in our Phonograph Memorabilia pages. Plus a new category featuring original 78rpm Record Sets with artists such as Lena Horne and Bing Crosby. And if needle tins are your thing... you'll find a lot of recent additions in our Needle Tins pages. Below is a detailed Directory to help you get around. So whether this is your first visit or a return trip to our web site, please feel free to check out all of our pages. You might find something you didn't expect. While you're here, let us know if you're interested in something or need any assistance. Phonograph Memorabilia  This is where you'll find fun things that any collector needs or wants and all of it for sale. Items such as: talking machine keys, old ads, record and phonograph catalogues, record dusters, paper records, and much more. Check out the Original Nickel Victor Key. Needle Tins  Neat old needle tins for sale. Victor, Columbia and other brands. Even some unopened needle tins. Phonograph Books  Victor, Edison and Columbia Phonograph related books. Great for the finding out detailed information regarding the big three and the models they produced along with how-to information. Phonograph Record Sets  Terrific 78RPM Record Album Sets from the 40s feature artist such as Bing Crosby and Glenn Miller. Perfect for playing on your phonograph or talking machine. New Phonograph Collectibles  You'll find some "New" Collectibles here. Victor and Edison Reproducers as well as cylinder phonograph and disc talking machine horns perfect for your Edison, Columbia or Victor machine. You'll find horn cranes here too! How about a Victor Orthophonic Reproducer? Sold Phonographs  Sorry it's sold.. but come see what you missed. All of these phonographs were sold and each are in good homes. Still it's a good spot to get ideas of the various phonographs available during the first quarter of the 20th Century and from Rose & Gracey's Antiques. Click on this page for information on how to order a particular item or if you're interested in our shipping practices. About Rose & Gracey's  Take a look at this page to learn more about us. Frequently Asked Questions  You have questions, sometimes we may have answers. Sometimes we even answered those questions. Check this area out to see some of the more common frequently asked questions and their answers. 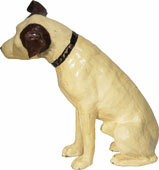 All images on this web site are property of Rose and Gracey's Antiques. No image may be used with out written permission. In business since 1986 and on the Internet since 1996!  want to join? The Phonograph Ring welcomes sites dealing with early phonographs, gramophones, cylinders, 78s and recorded sound in general. If your site fits this description, consider joining up! © 1996-2011 Rose & Gracey's Antiques. All Rights Reserved.